When it comes to killing zombies, there are a couple basic rules: Act quickly and aim for the head. Unfortunately, things became far more complicated for the group of survivors in “Wildfire," as everyone was forced to deal with the painful repercussions of previous week’s zombie attack. First, Andrea refused to leave Amy’s side. It was great watching Amy “wake up” as a zombie and struggle to get at Andrea. I kept waiting for Amy to take a bite from her sister, but it was the gunshot to the head that surprised me. I was glad that Andrea was the one to finish off her sibling, but did she really have to be that close? It was a very risky move on her part, despite her need for closure. Ed’s wife had to deal with the death of her husband, and she went to town on his head. The viewer discretion advised warning was definitely necessary here, as the repeated hits splattered parts of Ed everywhere. I wonder if she blames herself for his death or was simply taking out her anger over the abuse that she had received from him. Finally, the group discovered that Jim had been bitten. We got a chance to view how a small zombie bite affected someone. Feverish delusions and zombie nightmares don’t seem like fun. I wish Jim had been around a little longer instead of playing crazy gravedigger one moment, and sick zombie victim the next. As for Rick and Shane, the two were at odds over how to deal with the group. Rick wanted to lead the survivors to a Center for Disease Control, and Shane simply wanted to keep the survivors out of harm's way. Sometimes a little difference of opinion is a good thing, but not when it causes Shane to contemplate shooting Rick. Is he still hung up on Lori? Overall, aside from the dramatic tension that seeped into the character driven moments, the story progressed along. The group of survivors finally moved from their camp and headed to the CDC. The introduction of the CDC scientist added for some short background information on the zombie outbreak. I liked the video journal logs, but for some reason I kept thinking of the film, I Am Legend. I guess it’s hard not to make comparisons with other zombie/apocalypse movies. Once again, the ending of these episodes had me glued to my seat. The looming darkness, lack of shelter and food, and the threat of more zombies added to the tension of the group. 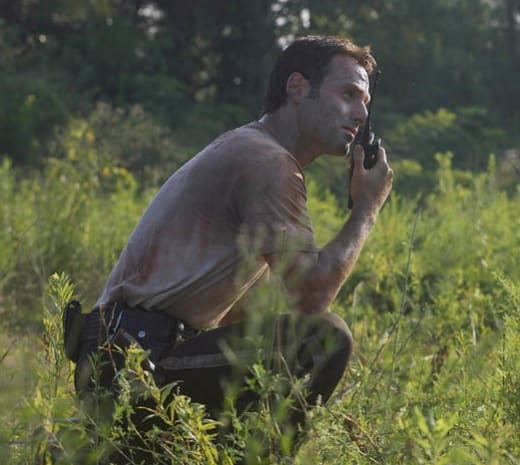 As the survivors panicked and Rick began to break down, I expected zombies to come around the corner. Instead, the haunting image of a flooding light encasing the group closed out the minutes. What a great cliffhanger. Will there be answers and assistance inside? We’ll have to step into the light to find out on next week’s season finale.